I just found this way cool workshop being held at one of this group's fave places! Pricey, but probablly not in comparison with other workshops of this kind. Atlas Obscura is joining forces with National Parks at Night to offer you a one-of-a-kind night photography workshop. Accompanied by two expert photography instructors, we’ll explore the more than 130 towering desert sculptures surrounding Borrego Springs, a number of which pay tribute to creatures that once roamed this same desert. 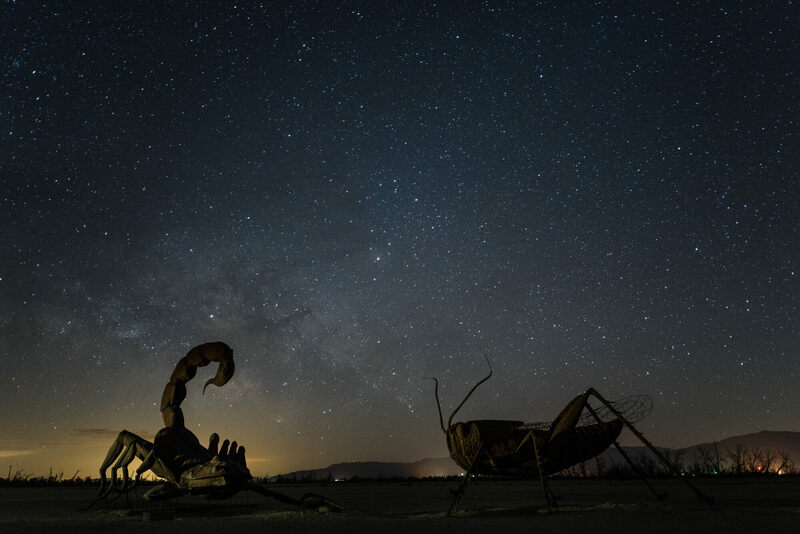 Borrego Springs is one of 16 International Dark Sky Communities, making it the perfect place to host our four-day workshop. The celestial core will break the horizon around 10:30 p.m. each night, with many of the spectacular sculptures aligning as perfect foreground subjects for the constellations. During the day we'll learn about light painting, night techniques, and post-processing. At night we’ll allow ourselves to be transported back in time—outfitted with 21st-century lenses—by the mesmerizing swath of light cast by the billions of stars in the Milky Way. This hands-on workshop is limited to only 14 students. National Parks at Night (NPAN) has been leading photo programs for the last three years. Their team of educators has been inspiring passionate students to “Seize the Night” with videos, workshops, speaking engagements, and articles featuring locations all over the world. NPAN aims to visit every National Park in America over the next 10 years—at night, camera in hand. A $500 deposit is required to secure your spot. This deposit is nonrefundable after three days. We have a limited capacity, and we expect the trip to fill quickly. The trip will cost $1,395 ($500 deposit plus $895 final payment) and will cover all workshop activities, including daily lectures, image review sessions, photo instruction in the field, and post-processing. The cost also includes a daily breakfast buffet at the hotel, snacks and water throughout, and our final group dinner. Accommodation at Palm Canyon Hotel and Resort is not included, but our travelers will receive a 10 percent discount on rooms or vintage trailers. There are other classes, especially local to AZ ones that are cheaper, but usually only offered once or twice a year and fill up fast. I am always looking for one to fall at the right time for me, but haven't had the luck just yet.